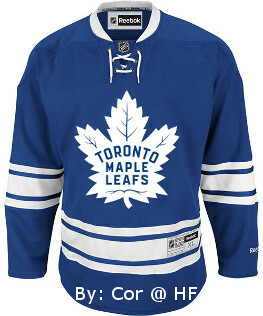 I have been saying for years now that the Leafs should go back to one of their classic logos. I’m really happy that a change was made! You can see the new 2016-17 Toronto Maple Leafs logo above. And in case you were wondering, below is the logo they used in 1939. As I previously said, they based their new logo off of this one. – Darker shade of blue. – Longer, thicker stem at the bottom of the Leaf. – Font is cleaned up and centered. – Minor changes to the shape of the Leaf. Chris Creamer’s Sports Logos has done a deeper breakdown of the differences between their new logo and their old one. “I thought it was important for us to get back to the story of why we became the Maple Leafs,” Shanahan said following the unveil. “There are some subtle changes to the logo, but, for those who thought we were going to look for some radical changes, we weren’t. The logo was designed by Reebok and will be arriving in time for Toronto’s centennial season (the 2016-17 NHL season). The team is also planning to have new uniforms next season as well. Like the logo, don’t expect to see any major changes in the uniform either. I would love to see something as simple as this.